Roofglaze would always recommend that an RG-80 Flatglass unit should be installed to a minimum pitch of 5° up to 5.5 m² and 10° over 5.5 m² in one panel. 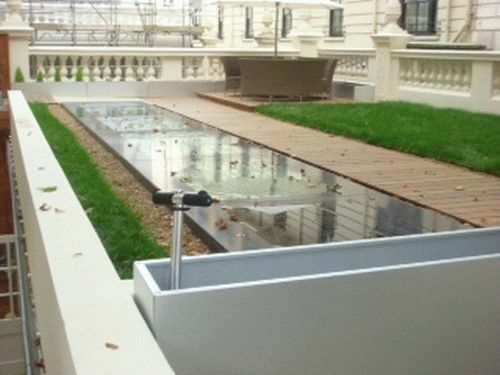 This is to help facilitate water run off thus reducing water ponding and to help alleviate the build-up of silt deposits. Double with hermetically sealed glass, finished with 78 mm sand blasted perimeter as standard but any size available upon request. Aluminium frame weight: 2.22 kg/m. With sandblasted border. Choose for residential glazing for up to 1.5 kN/m², 49.5 mm glass unit. With sandblasted border. Choose for commercial glazing for up to 4.0 kN/m², 65.5 mm glass unit. With sandblasted border. Choose for heavy commercial glazing for up to 5.0 kN/m², 71.5 mm glass unit. Heat soak tested toughened clear glass. Internal option single glazed laminated. To cover internal glazing bars. Sandblast all over or coloured PVB interlayer.